The rowans or mountain ashes are a genus, Sorbus, of about 80 species of shrubs or small trees of the rose family, Rosaceae, found throughout the north temperate regions. The American mountain ash, S. americana, grows to 12 m (30 ft) high. Its leaves are divided into 11 to 17 leaflets, and its flat-topped clusters of whitish flowers develop into bunches of small, reddish, sour but edible, applelike fruits. The Rowan, in the Celtic tree calendar, is associated with the second moon after Samhain. This normally means that it has Yule, Christmas and the New year in it. At this time of the year, the Rowan is an outstanding tree full of berries. The Rowan was planted especially around churches, to keep out the fey folk, and to turn evil magic (or in fact any magic) it is said to weaken physically and mentally those who are of the wise kin, or witches. These two factors may be the meaning of placing the Rowan moon at this time. Yule is the time that the sun departs and is traditionally midwinter, the time of death in the natural world when father sun and mother earth are both traditionally in the underworld. In the Battle of the Trees (Cad Gaddeu), the Rowan is included with the Willow. 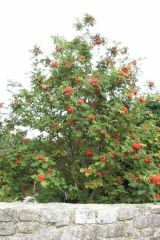 Throughout the British Isles, but especially in Ireland and the Highlands and Islands of Scotland, rowan was valued for its protective powers. Rowan tree loops, protective against witches. Two were placed on the railing of Dr. Alexander's house, Castleton, Yorks, the third on a gateway before the church porch. They were placed by a horseman who turned his horse thrice before setting each loop. The protective nature of the rowan is said to be due to its red coloured berries, as there is supposed to be no better colour than red for protection against evil. On the other hand, the white, scented, messy flowers have all the characteristics of the hawthorn and meadowsweet which are considered to be inauspicious. In Accrington, for example, it is considered unlucky to bring rowan flowers into the house. Homes, crops and cattle were particularly at risk on May (Beltaine) Eve. In Galway it is said they use rowan sticks in the crops on May eve to stopthe fairies taking the luck of the crops. In Co. Cavan, there is an old belief that butter would be taken off the milk if rowan berry is not tied to cow's tails on May eve. They cut rowan berries in the shape of a ring and use red string to tie it to the cow's tails. On May morning in Co. Wexford cows are struck with rowan twigs to stop any evil being put on them, reducing their value or taking their butter. In Ireland the rowan is said to be the home of good fairies. The rowan was also used to rescue people from the fairies and protect those doing the rescuing. John Rhys, in Celtic Folklore describes how to rescue someone held captive and dancing in a fairy ring. Two or more strong men hold a pole of rowan with one end in the middle of the ring. When they feel the captive grasp hold of it, they should pull the pole and captive away from the ring. The fairies will not be able to prevent it, because of their aversion to rowan wood. The dried rowan berry has been used for a number of illnesses, but is not used very much. Frost-nipped berries are a Polish remedy for stomache ache. Frost removes the sourness of the berry. They are infused in vodka for six months. The gypsies use the dried, ground berries as a flour to make small cakes for sick children. Rowan leaves as a tea: 1 ounce to a pint of water, is an Irish remedy for rheumatism. One should only drink a wineglassful of the tea. Also from Ireland is the asthma remedy of burning and inhaling the smoke of rowan leaves. Use these remedies at your own risk. I am not sure I would recommend any form of smoke when dealing with asthma.